High Quality Grooming and Kind Gentle Care of Your Precious Pet. We service Edge Hill, Whitfield, Brinsmead, Freshwater, Redlynch, Smithfield and surrounding suburbs. 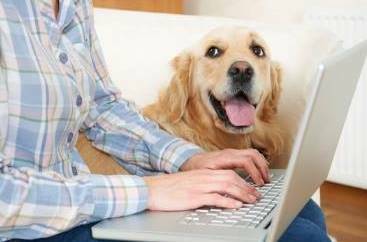 It may be more convenient for you to bring your dog to us, or if you live in a suburb outside of our normal service area. 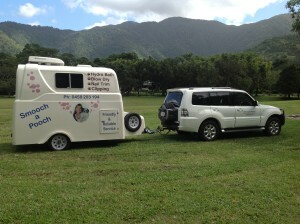 Jill has been offering an upmarket mobile grooming service for many years and will bring her luxury air conditioned mobile salon to your home to ‘smooch’ and groom your precious pet. Jill offers all grooming services including Luxury Wash, Full Clip, Nail Trim and Undercoat Strip. Click here to see the Grooming Services Offered and Prices. 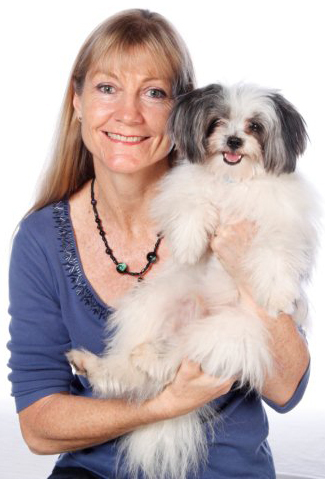 Jill and Ziggy, will ‘smooch’ your pet and make it look beautiful. Jill Matthews is a highly trained Grooming Specialist and will offer advice on what is best for your pet and how you can maintain the groom at its best until the next appointment. Keep your precious babies clean, healthy, neatly-clipped, happy and sweet-smelling. 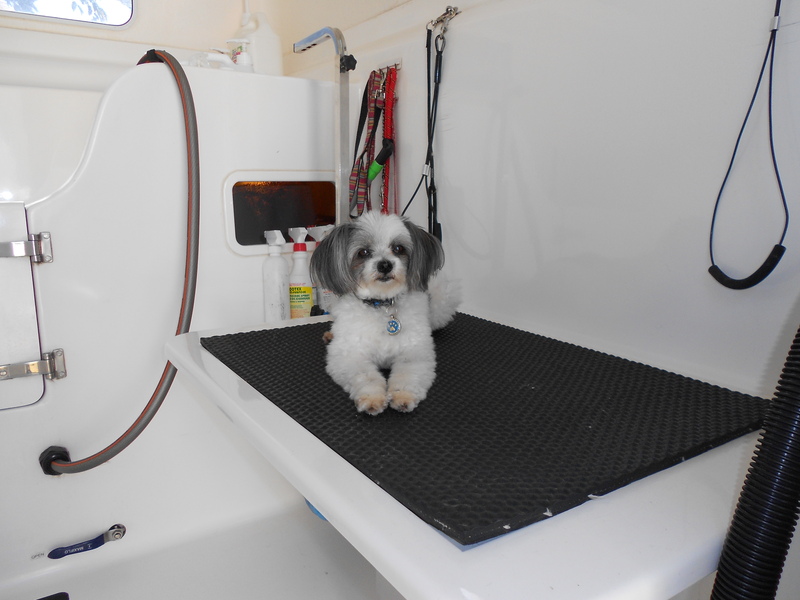 The Smooch a Pooch mobile grooming Salon provides a clean, hygienic, air conditioned and luxurious environment for your pet to be pampered. Jill is a true and passionate animal-lover with infinite patience. She will lovingly groom your pet and be soft, kind and gentle with it. She will not rush the grooming experience, ensuring that your pet gets the time and attention it needs. Nervous dogs will, over time, gain confidence and look forward to their grooming session. During the bathing session, she will get your dog clean using the highest quality shampoo products, remove dead and loose hair, massage the skin and finish off using a lovely conditioner for your dog’s coat to keep it soft and smelling gorgeous. We only use the best quality Plush Puppy organic products on your pet. You will notice how soft and sweet smelling your pet is after its bath and the coat will remain cleaner for longer. Every grooming session includes a full inspection and cleaning of eyes and ears to ensure they are healthy. We will also check for ticks and fleas, pluck out ear hair and trim over-grown nails. All-in-all we will make sure your precious dog leaves the mobile or home salon very clean and with a cute, practical haircut to keep him (or her) cool and healthy. “Kind, Gentle Care of Your Precious Pet”. Would You Like to Learn Dog Grooming? Dog grooming classes can be in your own home or Jill’s.